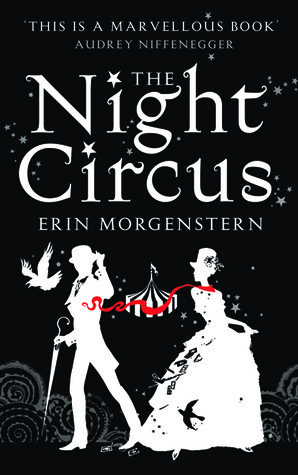 Serendipity Reviews: The Night Circus has arrived! Review and Giveaway. The Night Circus has arrived! Review and Giveaway. The Night Circus blog tour stops here today and I am happy to review the book as well as give away two copies at the end of the post! Published by Vintage in paperback on 24th May. The circus arrives without warning. No announcements precede it. It is simply there, when yesterday it was not. Within the black-and-white striped canvas tents is an utterly unique experience full of breathtaking amazement. It is called Le Cirque des Rêves, and it is only open at night. I utterly refused to get caught up with the fascination of this book to begin with. I ignored the hype, thinking this book couldn't possibly be as good as everyone was saying. I entered this book wary! Yet that first darn page sent shivers down my spine. The atmosphere emanating from the circus that has appeared from no where really pulled me in. I was then convinced that it couldn't possibly continue as such an entrancing and atmospheric read and searched for things to complain about it. I did struggle at first to connect to my characters, but that was it. Who was I kidding, I was hooked just like the rest of the world by this wondrous circus! I found it to be a magical, enchanting story that even made an appearance in my dreams! At the heart of the story lies a simple love story surrounded by an invisible web weaving its way through the circus, entwining ever element and every performer to it. Celia and Marco take centre stage in a very intricate wheel of trickery and deceit. At the beginning of the book, the circus is magnificent, completely flawless in nature. Yet magnificent isn't enough, as the circus begins to grow, the additional magical creations begins to cause a strain upon each illusionist involved and causes the circus to begin to crack. The circus begins to exhibit a little less sparkle and shine until the twins come to the rescue. The writing is poetic in nature; the words gently wafting off the page. The plot is extremely detailed and intricate; I don't think I have ever read anything quite like it. It felt like I had entered a darker version of Walt Disney World! The characters appear non descript to begin with, but as the story develops they cast a spell over you, drawing you into their deepest thoughts and fears. This truly is an amazing read. Everyone needs to take a ride through The Night Circus. Want to know more? Check out the link here to the publisher website. Want to win a copy? I have two copies to give away to anyone living in the UK and Commonwealth! The competition closes on the 2nd of June. Please enter your details in the Rafflecopter below. oops I entered before I saw that its for UK only. It's okay if I'm disqualified. I just wanted to say that after I read the review, the book sounds very interesting and mysterious in a way. This is the first time I heard of a circus themed book. Looking forward to it. Oh you must read it. I loved it, truly I did. This has been on my tbr since like forever!, so thanks for the giveaway :)and great review. I was also determined not to get caught up in all the hype but just like the Twilight books found myself being slowly drawn in. Terrible isn't it. We have no willpower! I've been wanting to read this for awhile, too bad the giveaway isn't for the US, too. I think I need to just buy a copy already! I'm sorry Jen. Publisher's rules. If I had a personal copy to send I would make it world wide. Hope you enjoy it. Glad you enjoyed it Viv, it sounds great. Isn't it funny when a book appears in our dreams? Great review! I love it when I dream about books. A sign of a good book. Yay! I'm so glad you ended up liking this one. It got me writing again - the writing is just so amazing! One of my favorites from last year. Wow! Amanda we never agree on books! I am so glad you loved it too!!! It is a big book. The size also put me off reading it for so long. Great review!! I have wanted to read this for ages!! Glad you are enjoying it too. Great review. Looking forward to read this book. Thanks for the giveaway. I have been wanting to read this for ages! Ive been very similar to you with this one Viv, I want to get it and read it but the hypes put me off in a big way... all the reviews are just too good (including yours) and I think I'm gonna have to read this! Oh you must read it Raimy!! This is the first time i've come across this book but i think i'm definatly going to have to read it now! Thanks for the giveaway. Awesome review, Vivienne! I absolutely loved The Night Circus! It was just completely magical! Gorgeous! Thanks for the giveaway!Night Circus looks amazing! I have both the book and audio and really need to make time for one of them. Everyone has liked this book and I'm glad to see you did too. On another note, I sent you an email a few days back asking if you wanted me to send you The Exceptionals. Take a look for it or shoot me off an email. Thanks for another lovely giveaway, I have been wanting to read this book for a long time, and have been impressed by the number of good reviews.